Simon Thacker is a Scottish composer who set up a leading international collective in the intercultural collaboration called Svara-Kanti. 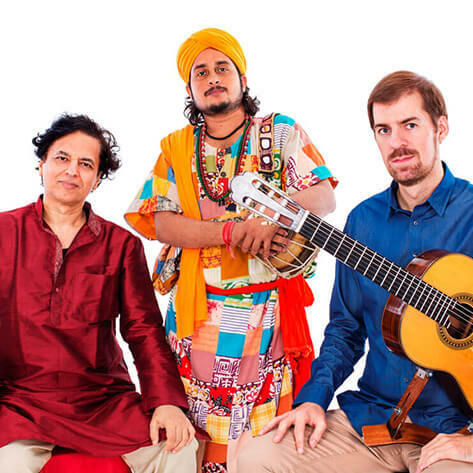 The collective is the virtuoso’s vehicle for extending and creating new traditions and sound worlds through his deep lifelong immersion in the folk, classical and spiritual forms of the Indian subcontinent. Svara-Kanti changes line-up depending on the focus of the programme. At The Sacred, Thacker will unite with one of India’s most beautiful folk cultures, the mystical Bengali Baul spiritual tradition, featuring mesmerising exponent Raju das Baul (voice/khomok) and the remarkable Hindustani classical tabla artist Rupak Bhattacharjee. The trio debuted in India to standing ovations in 2014, with the full programme premiering to an exceptional acclaim at the 2015 Edinburgh Fringe Festival, as part of the prestigious Made in Scotland showcase. Raju das Baul, from the Baul heartland of Santiniketan, possesses one of the most soulful voices on the world stage and is a master of the khomok, a characteristic Baul string instrument. Rupak Bhattacharjee , a prominent exponent of the Farrukhabad Gharana, Rupak is one of the most popular names in the field of classical percussion at present. His illustrious gurus include the living legend of tabla, Pt Anindo Chatterjee.